Is a Pro Bar Good for You? Home/Is a Pro Bar Good for You? Of course, this is a loaded question. And you know my answer is “It depends.” It depends on what else you are eating throughout the day, what you are drinking, what types of activities you are doing, your health & fitness goals, etc. Remember, all food has nutritional value whether it’s an apple slice, cup of yogurt, turkey sandwich or a piece of cheesecake. 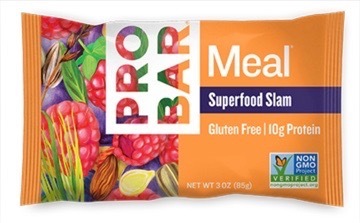 So instead of going down that path, I’d just like to review the PROBAR – Superfood Slam that a client gave me to try after a training session. Describing a Pro Bar is really a mouthful, literally. Har-har-har. The Pro Bar can best be described as a meal replacement bar along the lines of a Cliff Bar. At first glance, the bar appears to have a fair amount of carbs and fat. (See the Nutritional Info below.) Eric, 19 grams of fat!! 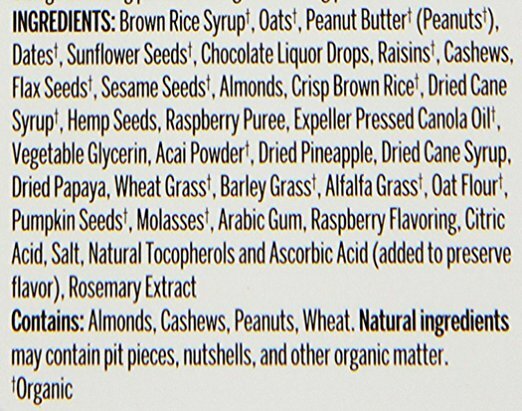 Yes, mostly unsaturated fats derived from seeds, nuts and canola oil. And remember this is a meal replacement and may represent 20% or even 25% of a person’s daily caloric intake. The next time you eat a sandwich, bowl of soup or a plate full of food, look at your meal in its entirety. The calories can really add up. The Pro Bar is an all-in-one meal or snack. How does it taste? I was pleasantly surprised with all of its nuts, fruits and seeds. It is complex and there isn’t one dominant flavor coming through. Plus, compared to many meal replacement and protein bars out there it doesn’t leave you with a synthetic aftertaste that gives you what I call “protein breath”. Texture wise, it has a nice “chew factor” and is not chalky or dry. So, yes, it tastes good. But it has too many carbs for my liking, leaving me with a “sweet” after taste. Meaning? Meaning that after eating the bar I wanted to eat something with carbs. Remember “Carbs beget carbs.” I would prefer a bar with less carbs and fat and more crunch. Hey, that’s a Cliff Bar. For me personally, a bowl of oatmeal topped with a handful of sliced nuts, diced fruit and seeds sounds better. On the plus side, I had no GI or stomach discomfort afterwards. What am I trying to delicately say? NO GAS and NO BLOATING. Again for those of you who have tried different drink mixes, shakes and bars, you know what I’m talking about. This is a big deal. The Pro Bar has a many healthy ingredients that you may not have in your current diet. Granted, there is only so much that you can pack into a 3 ounce bar. In addition it is gluten free (great for people with celiac disease) and is organic. These two items separate it from the pack. In conclusion, if you are looking for the convenience of a healthy, tasty, shelf stable meal, then this is right up your alley. Not for everyday eating, but just in case you forget to pack a lunch one day or are in a rush out the door. If that’s the case, I would focus on meal preparation and time management.